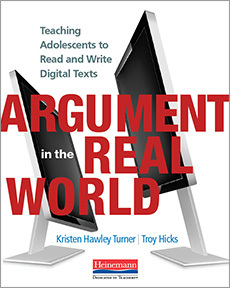 My latest column at Middleweb is a look at a new book by Troy Hicks and Kristen Hawley Turner, entitled Argument in the Real World: Teaching Adolescents to Read and Write Digital Texts. In the book, Hicks and Turner seek to explore the concept of argument — and its push deeper into classrooms with the Common Core principles — through the lens of digital media being used in the lives of many students. I posed some questions on my mind to the writers (both of whom I am loosely connected to through the National Writing Project), trying to parse out some ideas on argument in the age of technology and how teachers might tap into the ways kids write outside of school for the teaching of argument. They were generous enough to respond. Curious? Come read what Hicks and Turner said. And join the conversation in the comments there. This entry was posted in Middleweb. Bookmark the permalink.